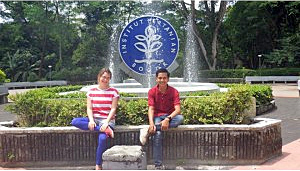 After 6 months of joint work at the IPB Department of Marine Science & Technology Thea Hamm (University of Kiel, Germany) and Prehadi (Bogor Agricultural University, Indonesia) completed the experimental part of their research project on “Thermal Tolerance in Sea Anemones”. This project was part of the annual, worldwide GAME Project (Global Approach by Modular Experiments) coordinated by the Helmholtz Center for Ocean Research in Kiel, Germany. In the current year, the project was conducted by partners in Germany, Japan, Wales, Brazil, Chile, Greece, Portugal, and Indonesia with a bi-national student team working carrying out ecological experiments in each of these countries. The Indonesian GAME Team was supervised by EMBRIO Director Dr. Neviaty Zamani and EMBRIO Vice Director for Research Training & Education, Dr. Hawis Madduppa, with support by EMBRIO International Senior Advisor Dr. Carsten Thoms.